Why Live With Your Old, Worn, Bent, Out-of-Spec or Damaged Op Rod? 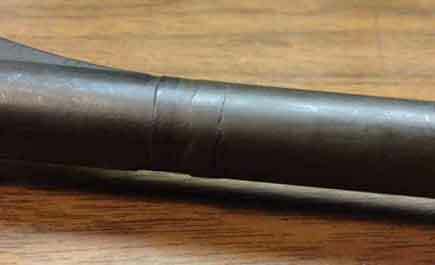 We have the experience and skill to rebuild your M1-Garand op rod to factory new specs. as well as rebuild M-14 and M1 Carbine op rod guide lugs. Simply ship your op rod to us. along with a total cost including insured return shipping. The decision is yours as to which services you would like to have performed. Standard turnaround time is approximately 4-5 weeks. Click here to download an order form to start the process. This service will always be performed when mechanical repairs are made to an M1 Garand, or M1 "Tanker" op rod. This service is not available for the other types at this time. We do not offer straightening, tilt test or adustments for M-14 op rods. $45 ~ Literally straighten a standard M1 op rod for use with Beretta-style low gas cylinder. Includes tilt test to ensure function with the drop-style gas cylinders. $7.50 per op rod ~ Over the years, we have been sent op rods coated in cosmoline, heavy dried grease, and generally heavily soiled oil and grease when coming out of long term storage. When it is necessary, we are happy to clean op rods like this prior to repairs, but they will be subject to a cleaning charge. To avoid this fee, please make sure the rods are clean prior to shipping to us. Shipping for larger quantities will be charged accordingly. or Paypal payments, an additional 3.5% convenience fee will be charged. There are surplus op rods available in the market where the rods have been demilled by cutting through the piston. There will be an extra charge to fill the notches the cut leaves in the tube. 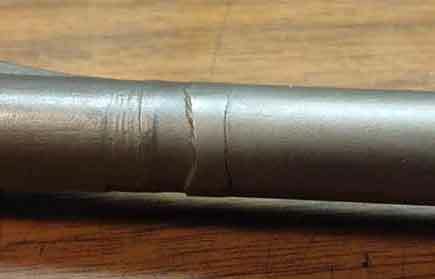 Some of the cuts leave notches which are significantly longer, those tubes can also be repaired for an additional charge. For guide lug rebuilds, there will be a minimal visibly affected area of Parkerizing. When your rifle is assembled, this is visible to the very rear of the rod where the handle meets the guide lug and is from final hand finishing of the machining. There will be other areas of the Parkerizing affected, but they are to the inside toward the receiver and the very bottom toward the guide lug slot. We do not currently offer Parkerizing services. Remanufactured op rods are op rods which have had the original tube replaced with a new tube, then refinished, giving the appearance of a “new” rod. In most cases, these rods are not even close to being able to mount in an M1, so they require more time to properly contour. Pistons also appear to have been left oversized. As a result, completing these rods takes more work than a standard repair, which is why these op rods incur additional cost for gauge check, straightening and tilt test. The price for sizing an oversized piston for a remanufactured op rod is the same as for a non-remanufcatured op rod. The photos below provide examples to help identify remanufactured op rods. The irregular coloring just forward of the original weld adjacent to the saddle is the weld attaching the new tube. This example has been finished off smoothly in that area and reparkerized. Please feel free to contact Mike Stacey if you would like more information. Copyright © 2010 Columbus Machine Works, Inc.